A smallish Kerala village has its entire population in the autumn of their life. Leading a lonely existence with none of their children around. The tiny but dollar-rich Kumbanad in Kerala is a village populated entirely by old people. Most of its sons and daughters are in foreign countries, they have left their elderly parents to fend for themselves in huge houses built with money sent from abroad. Located in the south-central Pathanamthitta district, Kumbanad is not even a dot on the map but has branches of most nationalised banks—even foreign ones—swollen with overseas remittances, apart from an array of ATMs. It also boasts the largest number of Christian houses of worship—at least fifty of them. On a Sunday afternoon, as usual, sonorous hallelujahs break the rural somnolence but there's a sad irony shrouding the congregation of old folks singing verses that thank the Creator for the good life. After all, there's little they can do otherwise. Meet A.G. Abraham, aged 97 years, resembling his biblical namesake, in his fairytale house plush with teak and every modern amenity. Once a successful trader in spices and coir, he had prudently spent on educating all his eight children. His wife died a quarter century ago. Today, his children and 30-odd grandchildren, comprising prosperous doctors, engineers and techies, try to ensure that the patriarch wants for nothing. One daughter lives several kilometres away and another lives farther in Thiruvananthapuram. But Abraham puts a brave face on his lonely existence: "Most of my children are just a bell away," he says, clutching his cordless phone as though it's literally his lifeline. The children have engaged a domestic help, Velayudhan Nair, at a monthly salary of Rs 1,500, supplemented by tips and gifts from abroad, and a maid to cook. Nair, who takes Abraham around in his wheelchair, says the old man's favourite pastime is a long bath in warm water. Didn't Abraham want to live with one of his children? "Been to Kuwait once," he replies tersely. "But I tell you, there's no place to beat my village. Now, I'm waiting for the final muster call." Abraham is one of the luckier ones. A study on the psycho-social problems of the home-alone elderly in Pathanamthitta says 25 per cent of them are widows living alone, 26.7 per cent do not have sufficient means for food and medical treatment, 88 per cent experience depression and gloom about being alone at home, 67 per cent feel there is nothing more left in life and their existence has no meaning and 60 per cent desire a faster end to their life so that they are not a burden to their children. Its author, Sister Jessina, notes, "Most of them do not have any kind of social involvement and a majority of them have withdrawn from all their past social activities. Prayer and religious activities are their only occupation." Fear and insecurity haunt them. Take the case of 89-year-old Mariamma Samuel, who lives with her maid in the adjoining village of Mullapuzhassery. She constantly dreads of burglars chasing her. "Somebody flicked my 2,000 rupees from under the pillow. There's no use complaining," she says resignedly. Mariamma's cousin adds that the old lady never opens her door for fear that she would be bundled off to an old-age home. Mariamma adds: "My only prayer to God is to take me away before I'm bed-ridden". Aleyamma Koshy, 80, who has rented out a part of her home, is not that depressed. At least she feigns so. Her son is doing well in the Gulf, but it's a grandson in the US who communicates with her and sends money. Her room is cheerfully decorated, with birthday cards from her great-granddaughters, and family photographs on the wall. Aggrieved that her son doesn't ring up? "No, not at all," she mumbles. Pathanamthitta district has the second highest number of emigrants in Kerala, with 44.3 emigrants per every 100 households, most of whom are highly skilled and earn good incomes abroad. (Malappuram has the highest number, with 45 per every 100 households, but the majority of these are unskilled labour). Not far from the Fellowship Hospital in Kumbanad is a mansion in which an 80-year-old woman lives alone. The manicured lawn, the silver cutlery and the airconditioners belie the decrepitude of the mansion's owner. Lying on a waterbed, she has refused food and water all day. Dr Jacob George, in charge of the mobile service attached to the Fellowship Hospital, is on call, but there's nothing much that man or machine can do for her now. Pathanamthitta also has the largest proportion of 60-to-80-year-olds of any district in the state. But dollar remittances from their children abroad are cold comfort for the lonely old parents. 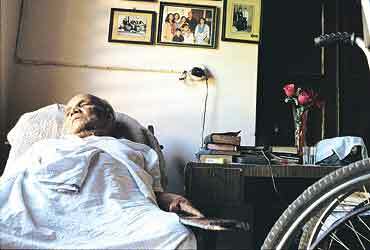 In this gloomy scenario, 96-year-old C.M. Mathew Chempothukalayil sparkles with impish wit and true grit. His prized possession is a vintage bicycle. "Two weeks ago, I pedalled up to Kozhencherry town," he chuckles, "and, ah, the doc has asked me not to do that again. He says my faculties are intact but our roads may not cope!" Every day, Mathew scours his favourite Malayala Manorama page to page, and enjoys watching TV serials. The old man is ready to entertain the visitor with schoolboy quotes. He reels off in fast pace: "Matriculation examination is a botheration for the Hindu nation (sic) who lives on the shores of the Indian Ocean, whose sole occupation is cultivation". Mathew draws his breath and adds: "This is what I got from school more than 75 years ago, when the British were still breathing down our necks." But in the midst of this joviality, his eyes well with tears as he recalls the death of his wife three months back. His eldest son is 73 years old and lives in Mumbai. His other children are in the US. And the secret of his youthful spirits and energy? "No smoke, no drinks and good food. My mother died at 102 years. So the last mile is still a long way off for me, eh?" Abraham Varghese, 70, and his wife are among the youngest people in Kumbanad. Their house is fitted with intricate anti-burglary devices. On Sunday mornings, some of Pathanamthitta's old folks gather at a rundown shack to discuss age-related problems. Retired bus conductor Yesodhara Panicker is in command at Vruddha Jana Vedi, an old-age forum. The group chips in to collect funds for the welfare of the less fortunate among them. The lone woman in the crowd, Rahelamma, shouts: "Sir, please ask the government to give us old-age pension". Panicker is perturbed over the scant protection from thefts and burglaries. And he wants the administration to allot the Vedi land to construct a pucca old-age centre. Abraham Varghese, relatively young at 70, says his house is fitted with anti-burglary electronic alarms which would wake up the entire neighbourhood. "But what's the use when a call for help would bring only guys older than me?" he shrugs. As local physician Jothy Dev observes, "During the several medical camps held here, I've found that the elderly seldom turn up because there is nobody to bring them. The phenomenon of loneliness and helplessness of old people amid growing affluence is increasing in Kerala." The statistics bear out Dr Dev's observations. According to a recent economic survey, "It is a noteworthy feature of Kerala that the percentage of the aged population (above 60 years) is fast increasing. From 1961 to 1991, there has been a 160 per cent increase in the population of older adults, with the majority being women." It is high time God's Own Country started paying attention to this issue. For Keralites, will Africa be the new Gulf?